Wood chess pieces is our speciality and we have various kind designs and models of chess pieces. 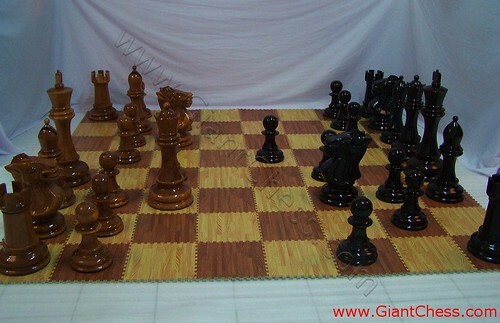 We have standart chess models, staunton chess, decorative chess, custom chess in various colors. The picture show one of our collection. The color is black and brown. We have another color or you can decided your own chess models and colors. Buy our collection of chess set for your collection, or you want to decorate your house with our big chess pieces. Furthermore, if you want to play chess using this kind of chess pieces, you should need the board also. On the picture above, we show you about one of our board. This is the mats chess or the foam board. By using this mats chess, the big lawn chess pieces are light enough to move easily. The chess mats will complete the chess set in your yard or recreation area. From amusement parks, and zoos to museums or resorts. Get this unusual chess board from us and we will you give you good in pricing.